I have bred two litters recently and I am unsure about what all could be produced! I am looking for best informed guesses about this!!! I will be posting updates on the babies and the poster with the most correct guesses wins my everlasting thanks and kudos! I took reference pics of the parents. The pics run a bit yellow, so please excuse that. 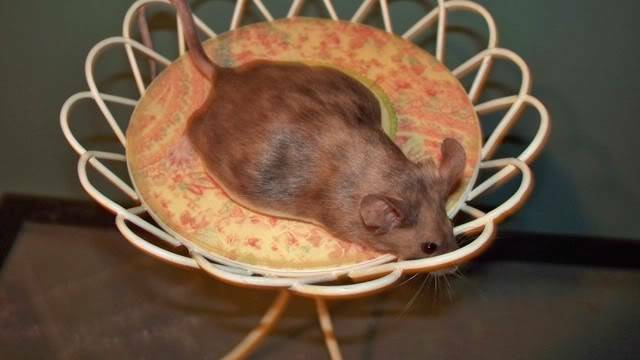 The colors on the mice are mostly true. The second doe, Daphne, is a weird one...I am looking for ideas on her color as well. 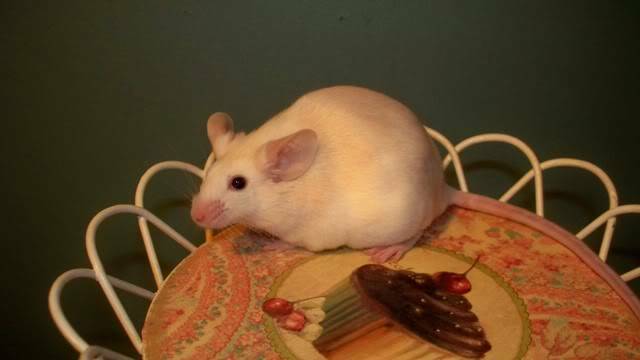 She is some sort of very light pied/broken marked, possibly agouti based. 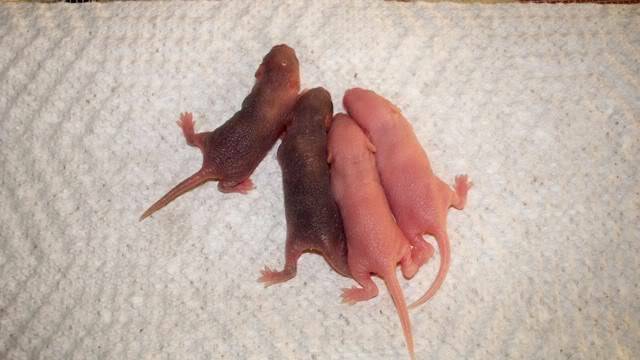 Her mother was a blue agouti with tri in her ancestry and her father was a black tri with quite a bit of beige. Daphne is just too light for me to tell exactly what's going on. 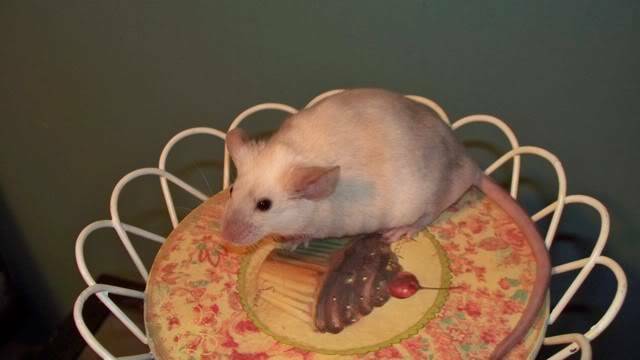 Pic is a bit yellow, but showcases her markings. The father of both litters is Dylan. He is Daphne's brother, from the same breeding. He is a suspected colorpoint tri. Confirm or add new ideas. I have been breeding my blues and tans into true "lines" lately, so it's a bit exciting to me to have some possible surprises come out of these breedings. I will be eagerly anticipating your best guesses, genetics experts!!! 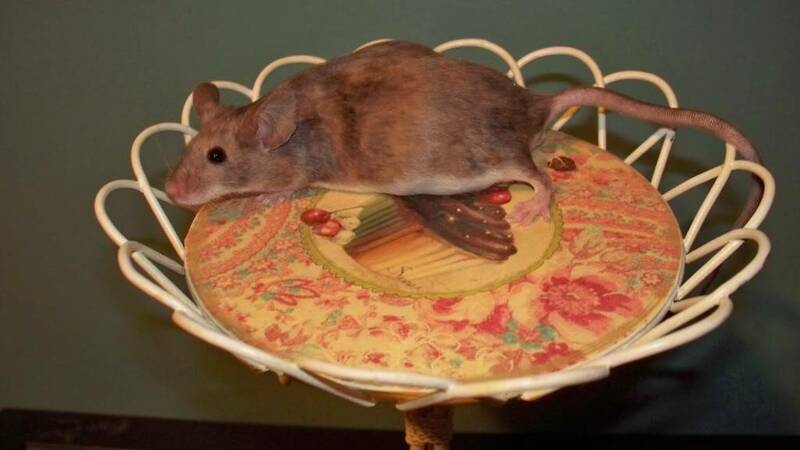 I'm guessing Mossie is too light for burmese (ch/cch), but too dark for beige (ce/ce), so I'm guessing cch/ce? Beth would probably have a better idea. If it runs true to color, it would have to be homozygous at the c-locus, though. 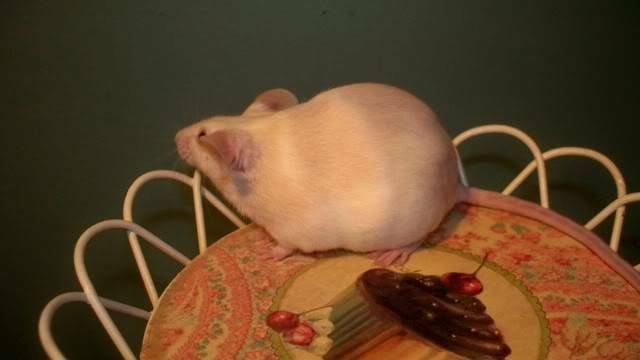 Daphne could be an off-white cream (ce/c) if her father was beige (ce/ce). She has solidly black eyes, and the faint difference between her pied spots and her base color is just so minimal that it's my best guess. Your buck, now. Dylan has the same beige-looking father, so he should have ce. He doesn't have to have c, and indeed it looks like he doesn't, though if their mother were full-color it would make things odd. Mum must be C/*, right? Now, he looks pointed, and honestly like a blue himilayan to me, which would suggest ch/c. That would've made dad ce/ch, and mom C/c. That seems reasonable all around. I'll post back after dinner with litter guesses. It's food now. I am already impressed! Awaiting your digestion! Mossies sire is a/a - B/b - c^h/c - S/s - Sa/sa - Spl/*, her dam is a^t/a - c^e/c^h - Re/re - S/s -Spl/*. So my guess is at/a - ch/ch - Spl/* possibly carrying chocolate, satin and pied. If she was ch/ce I think she would be lighter. I haven't spotted any chinchilla dilute in any of the lines but you never can be 100%. Is Mossie grey or brown? I realize the photos run to the yellowish, so I figured I'd ask. Given the parents, you could get any combination of ch, ce, and c. ce/c and ch/c are both definitely out as she's too dark. 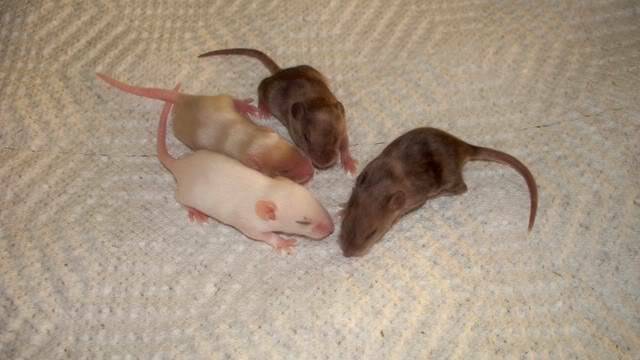 ch/ce or ch/ch are your remaining possibilities, and siamese seems to be a greyer mouse, while you get more of the brownish tinge to the colorpoint beige. Or we could just ask whether she has ruby (siamese) or black (cpb) eyes. And that brings me back to Dylan, who seems to have darker eyes than are reasonable for himilayan. Are they pink, ruby, or black? Pink would indicate himi in this case, with ruby meaning siamese, and black meaning cpb. Ah, the coats say one thing, and the eyes say another. Mossie has different shades of "brown". All of them have black eyes! 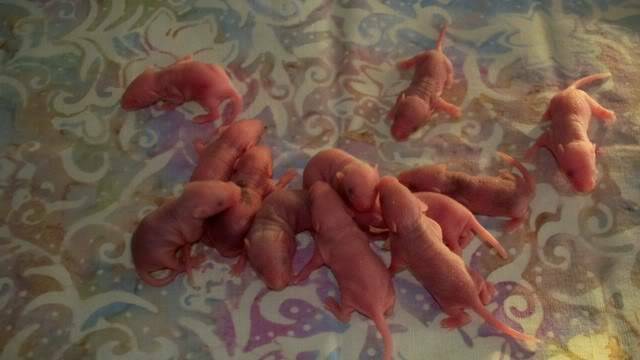 Daphne has 12 babies, one with pink eyes. More Info! If they've all got black eyes, that completely cuts out ch/c and ch/ch as options. ce/c is cream, a black-eyed very pale variety that's still my best guess for Daphne. ce/ch would give you black eyes with points like Dylan's, though he still looks blueish to me, leaving you with splashed colorpoint smoke. 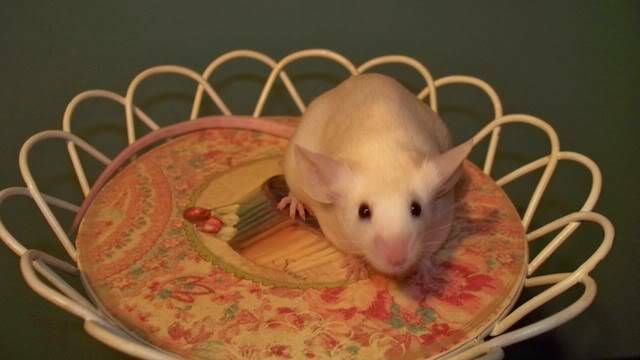 With black eyes, Mossie can't be siamese (ch/ch) or himilayan (ch/c), and she's far too dark for a cream (ce/c), leaving colorpoint beige (ce/ch) the remaining option. 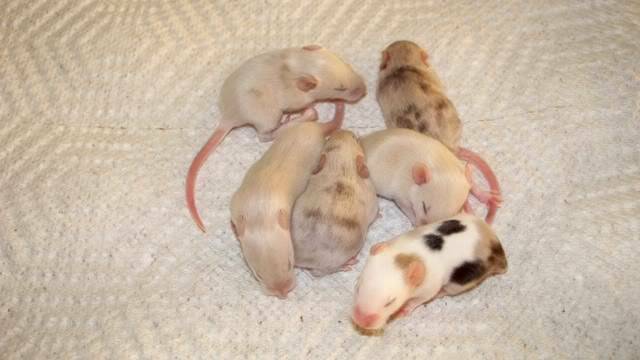 Bred to Dylan, Mossie would have more colorpoint beige babies like them, a few beige babies, and a few siamese babies. You'd get mostly black-eyed babies with a few pink-eyed, and all your pink-eyes would get points, as would most of your black-eyeds. Bred to Dylan, Daphne cec + cech would get a wider mix of c-dilute combos. You'd get more creams and more colorpoint beige, but also himilayan and regular beige. 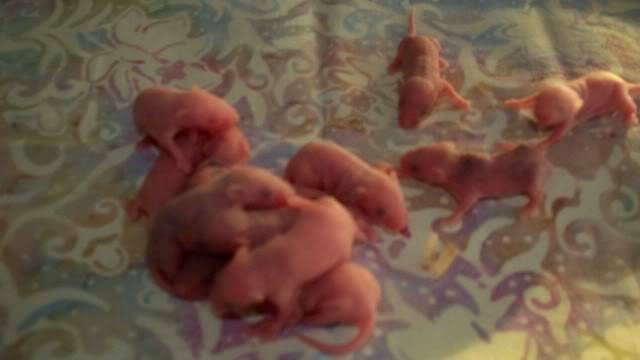 So you'd get mostly black-eyed mice and a few pink-eyed mice, with all your pink-eyed babies getting points and a few of your black-eyed babies getting points. Also, since Daphne and Dylan are siblings, we can guess it's likely Dylan carries pied. That gives you a chance at some tri babies in their litter. 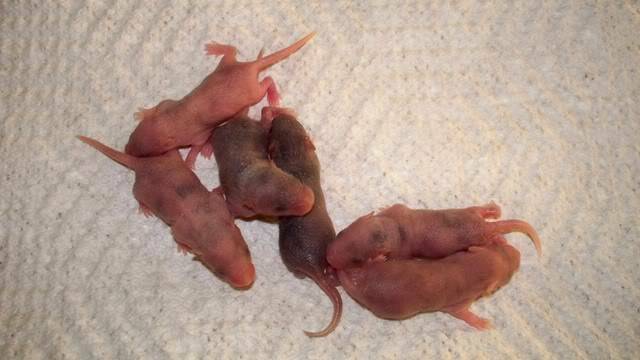 Whether you get tri babies in Mossie's litter depends on whether she carries it, as Beth mentioned it was a maybe. 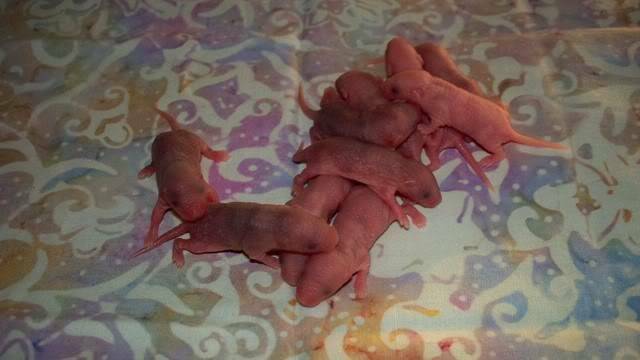 Mossie had her litter last night!!! TEN! ALL BLACK EYED!!! So no Siamese babies for her, I guess. 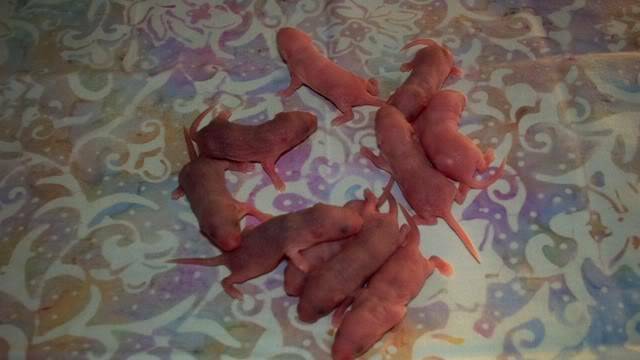 I am excited about Daphne's litter. I can't wait to see what all these babies turn into. One question, would any combo of Mossie's and Dylan's genes create anemia? I have one very pale female bub. ALSO, I had one very well reasoned person postulate that Dylan is Ivory based tri, which is what I thought initially. Any idea if that could be true? As for Dylan being a tri, it's certainly possible, but with the paler c-dilutes it can be hard to tell. I don't see it, but the difference between spotting-color white and the off-white you get from a c-dilted coat is easier to see in person. Anemia is something you get with variegateds, to my understanding? Not generally related to splashed, c-dilutes, spotting, satin, blue, tan, or any of the other genes noticed herein. 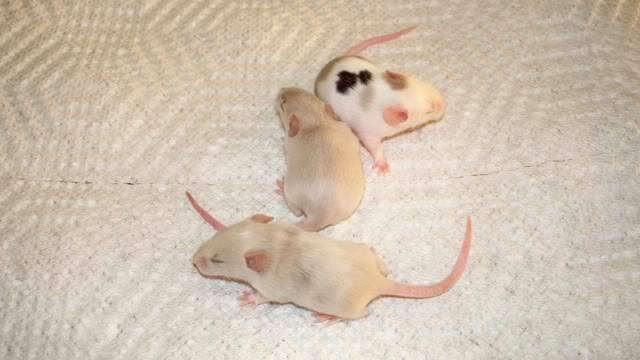 It would be quite odd if one of your splashed mice was actually variegated instead, since it's so rare. Update! 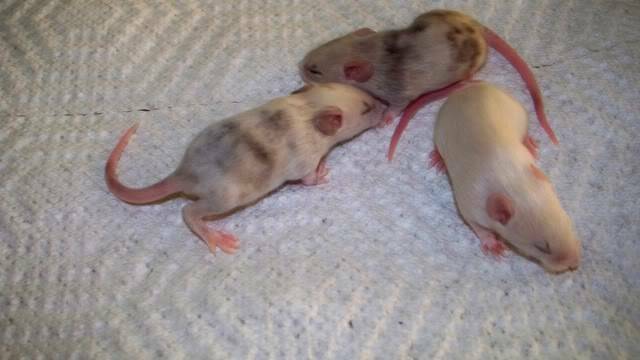 I cannot tell much yet, some babies are darkening a bit. ONE female baby in Daphne's litter is a nice black tri! Great little spotting and everything! Yeah, I am skimming through this and although I am good at c-dilutes, my little head is swimming. Just got over an ugly cold. You-all settle this one, please! I'll just watch. 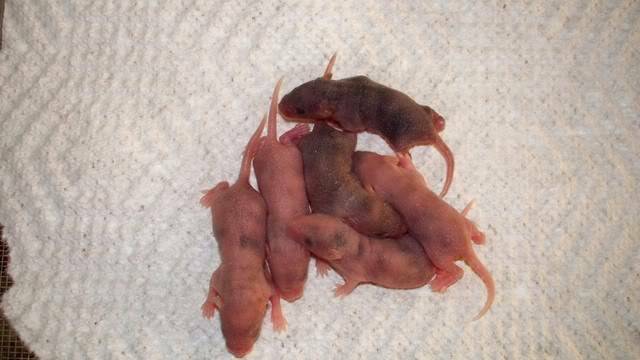 Mossie's litter...I think that not a few may turn out looking like her, splashed. 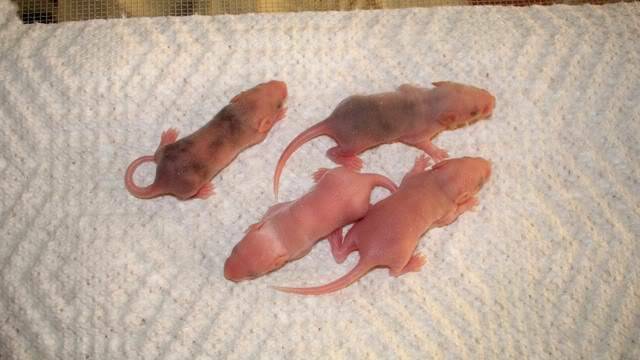 I will also be taking reservations in the next few days for these babies, if anyone wants, for pickup at Rodentfest. I definitely would love help now...all the babies are showing color and I don't know everything that I am looking at...also, I need help on what males to cull. If anyone wants a male, please tell me in the next few days please!!! 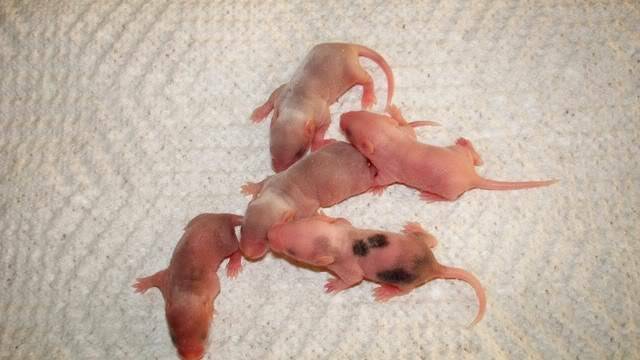 Males from Mossie's litter...here is where I need the most help!! Again, any help is really appreciated, as well as any reservations so I know what to cull, or opinions on what males to cull based on markings. You've definitely got some agouti based ones. That darker doe in Mossie's litter, and the lighter splashed buck of Daphne's. I still like that tricolor, nice bold markings. That is what I was thinking, Cindy! Agouti based! However, I have no idea how it snuck in....unless Dylan is secretly agouti based. I suppose he's too light to tell, but I could have sworn that he was a/a! 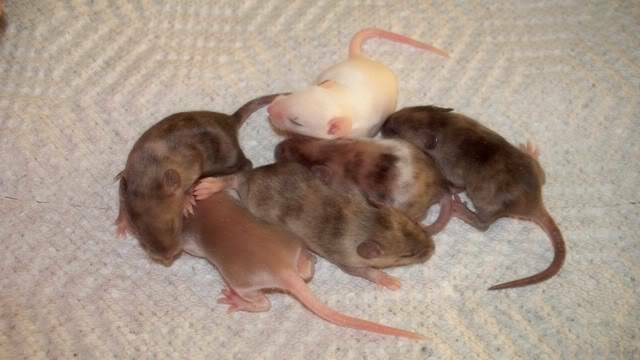 Also, how about the standard coated buck in Mossie's litter? I could swear he looks agouti based too. Thank you for the compliment on the tri! I like her!!! Just imagine me "squeeing" over your pictures because seriously, those bubs are gorgeous! Oh I hate living in NZ.. 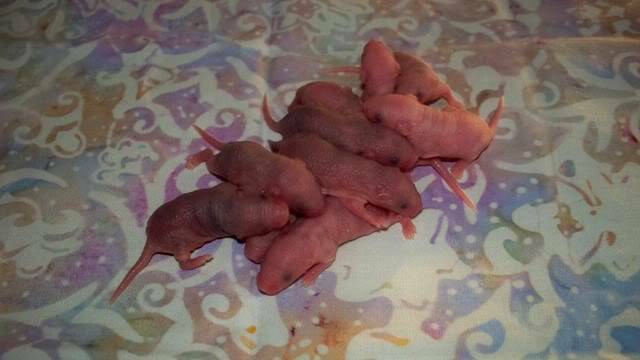 The lighter splashed buck in Daphne's litter appears agouti based, as does the very lightly splashed doe in her litter. 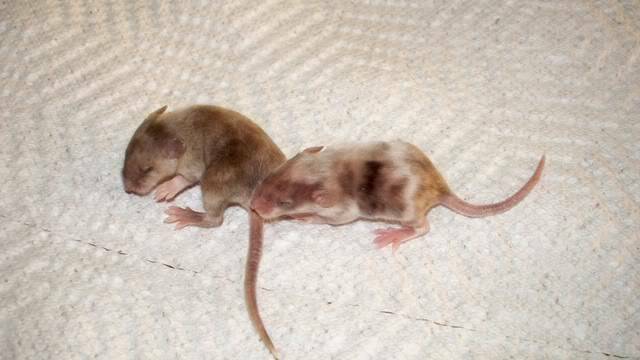 With there being agouti based pups in both litters, and Mossie obviously being black based I would say the sire is the cause. Agouti based splashed, especially the very light ones can be hard to identify as adults, but when they're young it's more obvious, something about how the coat grows out that makes the ticking harder to see properly. Cindy! 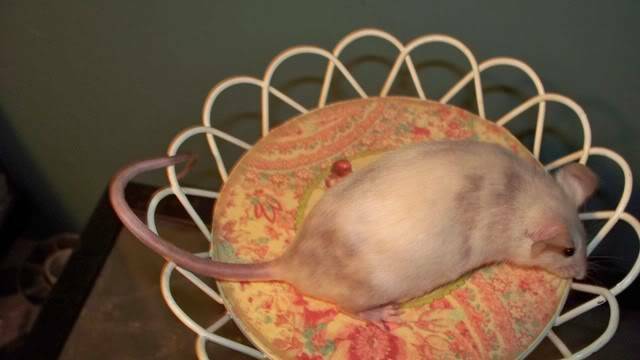 I am wondering if it's safe to call Dylan a blue agouti tri....this is what I see now, same with Daphne's two babies that you pointed out. This may seem like a silly question but are you certain Dylan is tricolor? I don't see any white patches on him and his pattern is more suggestive of splashed. That and I only see one pup that actually looks tricolor, and one that has a small white spot on her head, but the rest look like normal splashed to me. If I had to guess I'd say he's A/a */d ce/c S/s. 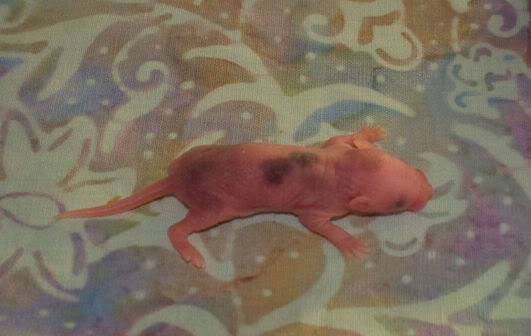 Dylan has some white spots, they are very faint because his base color is similar to Daphne's. In my photo, on my end, he has a large smudge of white across the middle of his back. His splashing is also rather pooled and concentrated in certain areas. I could be incorrect! My liking of these lighter neutral shades is making this very complicated! Isn't there white in the middle of Dylan's tail, too? Yes, there is, also some on his forehead. » Gold lucky knot, bear and mocha stamps...please help! Pics added! » Baby dragon on a necklace?